Colorado has the finest powder! The longest runs! The best apres-ski life! The best you-name-it! You've seen the ads. Of course you've seen similar ads for skiing in other places, too. So what is special about Colorado? 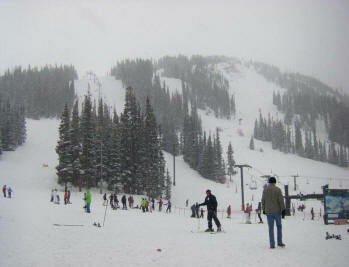 Judging by the devotees of Colorado's various ski areas, each ski area is the best. We humans tend to favor the familiar. That's why there is a place for all the ski areas. Nevertheless we make an attempt here to describe each so you can select the area you would prefer if you are new to the region or are curious about trying a ski area new to you. Four of these ski areas are within a few miles of each other in Summit County: Arapahoe Basin, Breckenridge, Copper Mountain, and Keystone. All the Summit County areas are at high altitudes, so consider the effect on your breathing. Arapahoe Basin (Summit County): exits. Known as The Legend, one admirer opined that in fact God had not made the world in 6 days and then rested on the seventh, as suggested in the Christian Bible's Old Testament. He said God had saved the seventh day to concentrate on making just Arapahoe Basin! The Basin is an area at high altitude with many extreme runs into couloirs, off cornices, through steep tree-slopes and down avalanche chutes. And so its reputation is as an area for expert skiers. It is that, but it also has beginner slopes, and intermediate terrain even from the highest lifts. Arapahoe is at a higher altitude than other Colorado ski areas, so effects from that can be an issue for some lowland visitors. Views of the mountain scenery are spectacular. Lifts have recently been updated, and the season starts early (by mid-October) and lasts late (into June often and even until August 14 once). Earlier in the season, steeper slopes may not yet have enough snow to cover their rocks but with snow-making to add base, the intermediate runs can be a delight with the colder powder of this high altitude. No accommodations are here, only lunch service, but runs finish at or near the day-lodge, making it easier to find your skiing buddies or kiddies. And parking is free with a walk that does not pass through condominiums or retail shops. Arapahoe Basin also operates Bear Valley: exits in California. This web-site's developer, Bill Jones, ski instructor is authorized to teach at Arapahoe Basin as well as the Vail Resorts ski areas: click to book a lesson from Bill. Arrowhead. See Vail/Beaver Creek/Arrowhead below. Aspen areas: exits. Four major ski areas are at or near the old mining town of Aspen. Abundant accommodations, classy shopping, and night life are here and at nearby Snowmass Village. Aspen Mountain has varied terrain, Aspen Highlands has abundant expert slopes, Snowmass is good for all levels, and Buttermilk has terrain for beginner and intermediate level skiers. There is an airport at Aspen with scheduled commercial service. Beaver Creek: exits. Also see Vail/Beaver Creek/Arrowhead below. Beaver Creek is included in the Vail Resorts EpicMix. Breckenridge (Summit County): exits: Some years more skier days are recorded at Breckenridge than at any other U.S. ski area. It's a major area with 4 peaks (called 7, 8, 9, & 10 for their positions along the Ten-Mile Range ridge), lots of lifts, varied terrain with gentle beginner slopes and outstanding expert ridges and bowls and chutes. The top of the highest lift is 12,840 feet altitude almost on the highest ridgetop in the photo below (advanced and expert terrain only). Base areas are at Village and Beaver Run on Peak 9 and at Peak 8, each about 9,200 feet. International ski races and freestyle and snowboard events are held at Breckenridge. At times this ski area lives up to its nickname Breckenfridge and at others Breckenwind, so be prepared with appropriate clothing, goggles, sunscreen, etc., but there are strategically-placed day lodges at several of the lift tops and bases for on-mountain warmups. The fact that Breckenridge often records more skier days than any other North American ski area shows that most find its environment quite acceptable. The lift layout once took time to get in mind and has daunted some in the past, but a peak-interconnect lift and improved signing now make the slopes skier-friendly. A new gondola from town to the slopes eases both access to the mountain and egress from it at day's end. There is also a "Four O'Clock Run": you can ski to your condo or car in town. The nearby town has abundant accommodations and a quaint "pseduo-historic" architecture with plenty of dining and apres-ski activities. Breckenridge is part of Vail Resorts: exits. Breckenridge is included in the Vail Resorts EpicMix. See the Breckenridge ski trail map including Peak 6, new in 2013.This web-site's developer, Bill Jones ski instructor, has been based at the Breckenridge Ski School and can teach there: click to book a lesson from Bill. Copper Mountain (Summit County): exits. Here is another fine Colorado ski area with abundant lifts and terrain that naturally segregates the skiers by ability level. Excellent extreme skiing bowls are present and these often have powder snow that is new or has stayed cold enough to behave like new. There is outstanding terrain for beginners to learn. Accommodations and restaurants are near the lift bases. The area is operated by Intrawest: exits the company that developed Whistler-Blackcomb Ski Area in British Columbia and which operates several other resorts as well including Winter Park in Colorado and Stratton in Vermont. Crested Butte: exits. Slopes here include degrees of difficulty for all, with both beginner areas and challenging slopes. Extreme skiing competitions are held here. Crested Butte's mountain scenery is awesome on clear days, especially from the on-slope day lodge. The modern town of Mt. Crested Butte sits at the mountain base, and a few miles away are the quaint buildings of the early Crested Butte mining town , both now providing plenty of dining, lodging, and apres-ski activities. *Keystone (Summit County): exits. What is special about Keystone? It has an advanced-beginner slope that is a bit over 3 miles long (pictured at right). 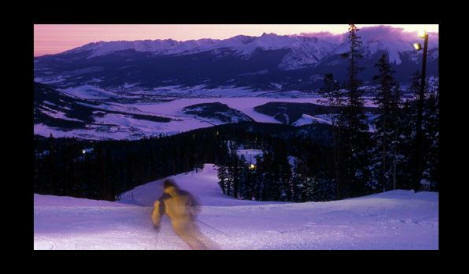 Keystone is also known for abundant intermediate runs. And in recent years it has added lifts to bump slopes on North Peak and others that extend into "outback" areas of advanced terrain including small bowls where one can come as close to enjoying the (shared) solitude of nature as can happen at any downhill ski area. Keystone makes lots of snow to ensure quality of experience, and has a reputation for quality machine-grooming of its runs. There are conveniently located accommodations, and apres-ski life has expanded at the developing River Run base area. This is the only area in the region with night skiing (check for selected nights during principal season). Most of Keystone's runs are more sheltered than those at other Summit County ski areas because almost all of Keystone's runs are lined by forest. Sno-cat skiing is offered, subject to conditions. Keystone is part of Vail Resorts: exits. 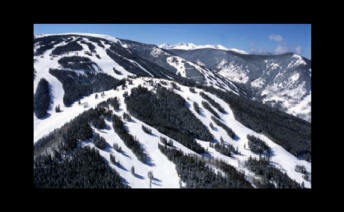 Keystone is included in the Vail Resorts EpicMix. This web-site's developer, Bill Jones ski instructor, has been on the Keystone Ski School staff and is authorized to teach there: click to book a lesson from Bill. Steamboat: exits. Here is another massive Colorado ski area, this one some 90 miles north of Interstate 70, and with a nearby commercial airport. Skiers of all ability levels find slopes here to enjoy, and the snowfall here is usually more abundant than at most other Colorado ski areas. The base altitude of Steamboat is a bit lower than at other Colorado ski areas, making breathing easier but also producing slushy snow sooner at season's end. Accommodations are plentiful at the resort and in the nearby town, where there is a natural warm-spring municipal pool and shops and restaurants. Snowcat powder skiing is provided nearby, a less expensive alternative to a helicopter skiing vacation. Telluride: exits. In the southwestern corner of Colorado is an old mining town with a fantastic modern ski area, having great beginner and expert terrain and everything in between. On clear days, the views west into the adjacent desert and east into the ski area and town's glaciated valley are worth riding the lift just to see. Accommodations are plentiful, as is night life. Helicopter skiing can be arranged. There is an airport on the hill above town. *Vail/Beaver Creek/Arrowhead areas: exits. Vail Mountain is the biggest ski area in the United States, with some 5,289 acres--for some skiers an awesome opportunity to explore and for others, overpoweringly large. There is great bowl skiing, although some bowls face south and at times especially in later season catch enough sun so their snow gets heavy. To prevail, just ski the storms or get out soon afterwards before the sun has warmed the snow. Or, pick the best spots of the day; you'll have plenty of choices. Terrain is varied, with plenty of intermediate and advanced to expert terrain, and the town of Vail can respond to almost any need. The Vail Ski School is probably the largest in the country, with some 1200 full- and part-time instructors, and is a standard-setter. Beaver Creek is an alternative to Vail for those who want slopes that are usually less populated or are looking for expansive beginner terrain (on the upper part of the mountain. Yet Beaver Creek has also hosted world-class downhill races and has steep-steep bump runs appropriately named for birds of prey. Vail/Beaver Creek/Arrowhead areas are operated by Vail Resorts: exits. Vail./Beaver Creek/Arrowhead are included in the Vail Resorts EpicMix. Travelers can fly into Denver International Airport and take a shuttle to Vail or come in to the Eagle County Airport, which is nearer but with fewer connections. 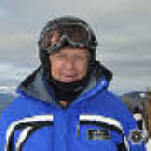 This web-site's developer, Bill Jones, ski instructor, has been on the Vail Ski School staff and is authorized to teach there and at Beaver Creek: click to book a lesson from Bill. Winter Park/Mary Jane: exits. How many cities have their own snow park, especially one as large as the combined Winter Park/Mary Jane ski areas? Although an hour and a half away from Denver, Winter Park is one of that city's parks! On certain days, you can even take the ski train from downtown Denver to slopeside. 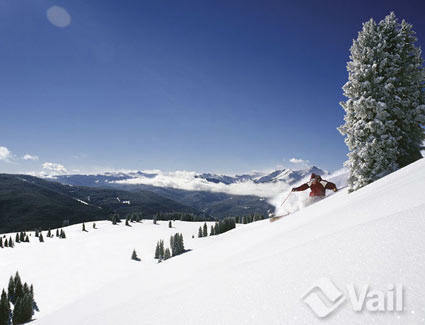 Another of Colorado's high-altitude ski areas, Winter Park is also a large, varied area with terrain to please all. Snowstorms may leave a bit more here than is typical for other Colorado ski areas, and there is a handy ski town. While many expert skiers enjoy the bumps of Mary Jane the most, others find plenty to do on the runs at the older, more-comfortable-to-them Winter Park section of the ski area. Intrawest, owner of Copper Mountain, also operates Winter Park. 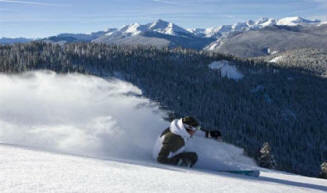 Additional, smaller, ski areas are in the central Rockies, each with its own character and fans and all worth a visit: Eldora: exits, Loveland: exits, Powderhorn: exits, Ski Cooper: exits, Monarch: exits, Wolf Creek: exits, Sunlight: exits, Ski Durango: exits and Granby Ranch: exits (was Sol Vista). Also see www.coloradoski.com. For current ski conditions at Colorado resorts, go to http://www.snocountry.com/ski-reports/colorado. This "Skiing the Colorado Rockies" page last modified 11/03/2017 07:21:37 AM. Did you come here from a link on another website? For latest version of this page, copy to your browser: http://www.SkiMyBest.com/skicoro.htm. Copyright © 2013, 2014, 2015, 2016, 2017, 2018, 2019. William R Jones.